You could spend a beautiful SUNDAY MORNING, soaking in the rising sun and history of more than a century-old Sassoon Docks in the heart of Colaba! #SassoonSundays guarantee the curious travelers; domestic/foreign tourists and Mumbaikars the perfect Dock experience at the 143-year old iconic structure. This tour will provide a glimpse into the lives and cultures of Koli and Banjara communities inhabiting and working at the Docks. Cultures that have been fairly intact since the Docks were first built. Built more than 140 years ago in 1875 by a Baghdadi Jew named David Sassoon, Sassoon Docks is the oldest in the city and one of the largest fishing markets in Mumbai today. This iconic heritage site bustles with people and fishing activities everyday making it a photographer's delight. 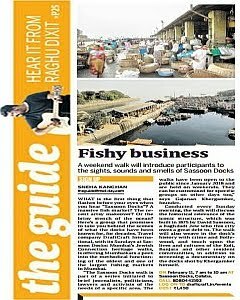 But there is much more to Sassoon Docks! The smell of fish, the loud bargaining voices of fisherwomen, the hurtling ice-bearing hathgadis and the basketfuls of fish freshly plucked and glistening adorn the city's oldest docks. The way they work at the boats, sell their wares in the morning, load the hathgadis with ice and heave their way through the slippery waters of the Dock, clean the jhingas (prawns) outside godowns and more. #SassoonSundays will also expose you to the recent history of the docks. Sassoon Docks has been at the epicentre of crimes that shook Mumbai in the past. At the same time, the docks have featured in numerous Bollywood movies and a closer look at the new and the old docks will remind you of some famous scenes and shots, even some epic Amitabh Bachchan 'The Angry Young Man' movies! Without an early morning tour of Sassoon Docks, a trip to Mumbai would be incomplete. - Witness fishing activities such as loading, unloading, stitching fishing nets, etc. MEETING POINT: DraftCraft - The Mumbai Studio, Colaba (See Map). It is situated 350 m from the iconic Sassoon Docks. Email events@draftcraft.in or Call/WhatsApp at 8080441593, after which availability and payment information will be provided. 1) Cash - You could make a cash payment, in full and in advance, at DraftCraft - The Mumbai Studio located in Colaba (See Map). 4) Online Fund Transfer- Contact 8080441593 for details. IMPORTANT - After making payment by Paytm OR FreeCharge OR Online Funds Transfer, confirm payment by sending (through WhatsApp) a snapshot of the transaction to 8080441593. Following this, DraftCraft will confirm receipt of payment by way of SMS or WhatsApp message. DraftCraft is an international think tank that works primarily in the area of social justice. DraftCraft is not an NGO and all income is taxed in full. Funds generated from the event are directed towards pro bono activities in the respective site such as legal aid camps, workshops for awareness and education, community welfare and women empowerment initiatives, films produced to spread knowledge, document culture and practices, etc. 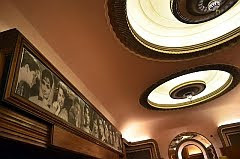 DraftCraft organises Walking Tours, Heritage Walks, Photo-Walks, Film Screenings and Expert Talks on heritage sites across India under the DraftCraft Heritage Project. You may visit www.draftcraft.in for an insight into DraftCraft's wide range of activities and works. DraftCraft works on a wide range of issues of social justice across borders, communities and tribes. If you are interested in VOLUNTEERING, you may contact us on 8080441593 or email at contact@draftcraft.in and we would love to meet you. - All payments are to be made in Indian Rupees (INR). - Payments need to be made in advance, after confirmation of availability. - Any Change or Cancellation will be accommodated ONLY in advance. - For Change of Date, there will be no refund and the next available slot will be allotted if the request is made 24 hours before the start of the event. - Any Cancellation till 48 hours before the start of the event may be accommodated and a 75 per cent refund of the registration fee will be made. Cancellation requests after this time will not be adjusted. - Participants are advised to stay with the group and follow instructions provided during the tour or event to avoid any mishap or loss. - Concurrently, should any damage to property occur, the loss will have to be compensated for by the participant(s) responsible. - Neither is DraftCraft or any of DraftCraft's management or volunteers responsible for any unforeseen loss or injury or damage brought to a participant's personal belongings or personal vehicle during the tour. - All disputes are subject to Mumbai jurisdiction only and will be dealt with through Arbitration, Conciliation and Mediation only. - DraftCraft reserves the right to admission and expulsion of participant(s) for benefit of group members, law and order or for any reason following failure to resolve an issue. In such situation, no refund shall be provided. - It is mandatory to disclose any personal medical conditions so that prior arrangements can be made. - Smoking or consuming alcohol (without requisite permit and permission) is strictly prohibited during field trips or tours, particularly in public places. - By registering for the event, you undertake that you accept all conditions and pre-requisites unless refuted and communicated in writing. - If any participant is found violating the rules, DraftCraft reserves all rights to remove the participant from the group. In such a situation, no refund shall be provided. NOTE: All visuals are indicative and used for representational purpose only.